Why stick with the boring way of simply handing out money in an envelope when there are so many fun ways to give money? Money gift ideas are becoming more and more popular these days because it can be challenging to find a gift that your recipient would absolutely love. But cash gift ideas don’t have to be boring! If you’re looking for ways on how to give money as a gift or how to make gifts out of money, we’ve got you covered. 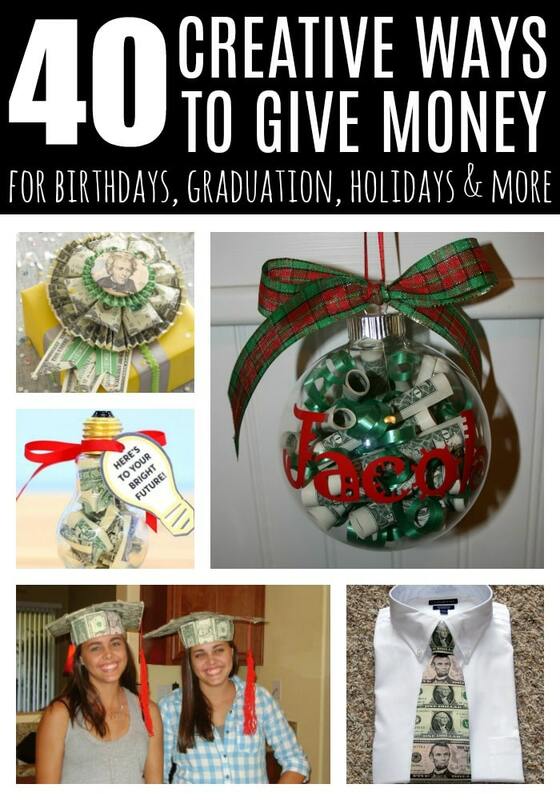 Here are 40 Creative Ways to Give Money that covers all holidays — from Christmas money gift ideas to graduation money gift ideas or even money gift ideas for birthdays, these clever ways to give money will make sure that you’re still giving a cool and interesting present even when you choose to gift cash! Money Birthday Cake – This awesome cake definitely tops the list of unique money gift ideas! If you’re feeling generous, this three-tier money birthday cake will be perfect. Money Necklace – This chic necklace looks so good, your recipient will probably be duped into thinking it’s actual jewelry at first glance! Money Rosette Bow – How about wrapping your gift with cash? This money rosette bow looks so intricate! “Rainy Day” Fund – Shower your giftee with cash with this awesome “rainy day” fund idea! Money Tie – Gifting money to someone for a new job? 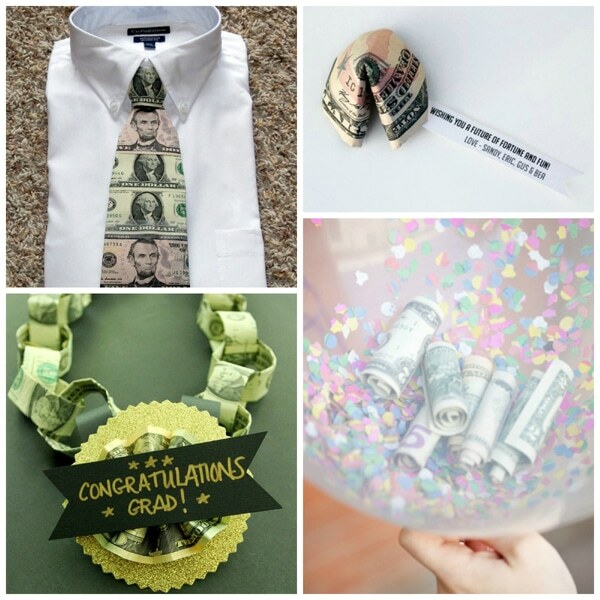 This money tie is definitely one of the best creative ways to gift money for such an occasion! Money Fortune Cookie – What a cute little package! Surprise your giftee with this adorable money cookie and a bonus fortune all in one! Money Chain Gift For Graduate – Your new graduate is going to love this money chain! Surprise them with it right as they step off the stage! Money Balloons – Fill some balloons with money and confetti and let your gift recipient have fun popping them! Money Tree Topiary – Money doesn’t grow on trees? Think again! This money tree topiary looks amazing and is a sure win for the cute ideas for giving money category. Tissue Box Money Gift – Puns are fun! This tissue box money gift complete with the funny statement is a great gift for pun lovers. Pizza “Dough” – Here’s another pun-ny one! This pizza “dough” cash gift is definitely a cool present. Lightbulb Money Gift – Clear bulbs + money inside = brilliant idea! 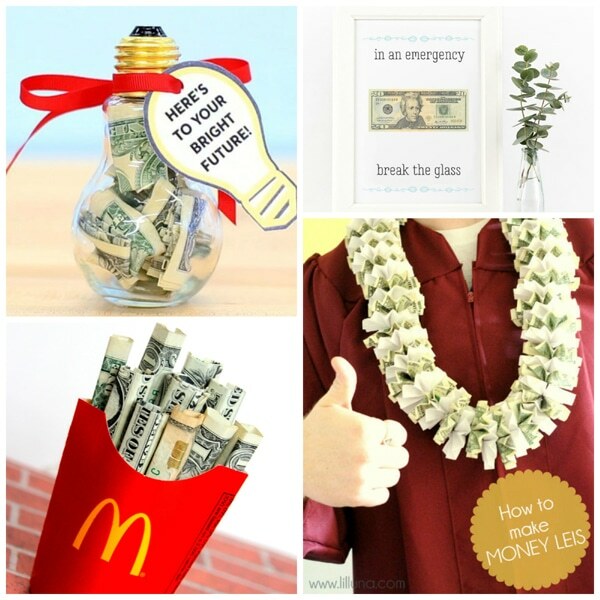 In Case of Emergency Grad Gift (With Free Printable) – Awesome money gift idea! Don’t worry about designing the print, there’s a free printable for you right here. DIY Money French Fries – This is definitely one of the most creative ways to give cash! Gift it to the fast food lover in your life! 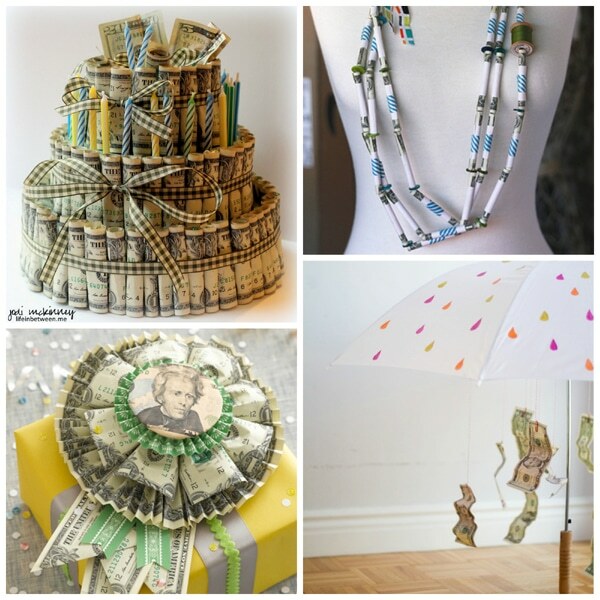 Money Lei – Hawaiian themed birthday party? This money lei is the perfect gift for the birthday celebrant. 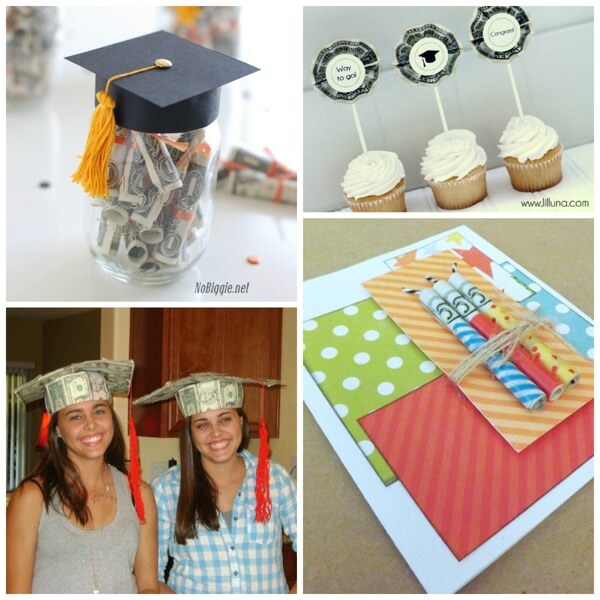 Mason Jar Graduation Cap – These creative ideas for giving money will be much appreciated by recent grads who are definitely in need of “starting out” funds. Money Cupcake Toppers – These money cupcake toppers look so inconspicuous, they will get a double take. Plus points for the delicious cupcakes too! 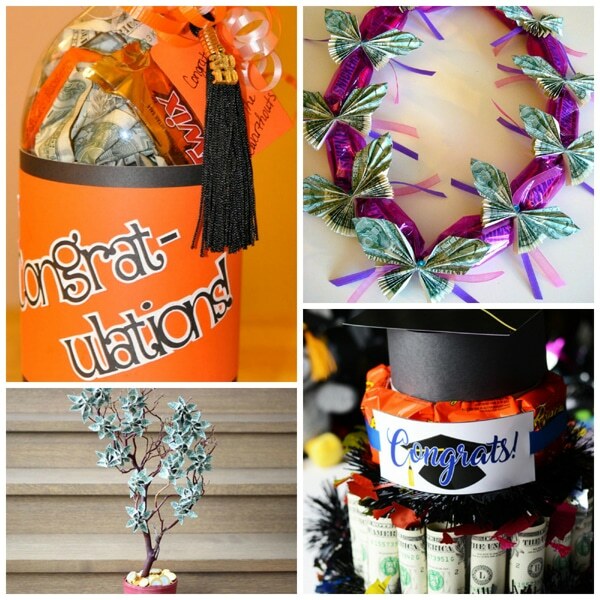 Graduation Money Cap – Another awesome money gift for graduates right here! Look how happy those recipients are! Money Candle Card – Spice up the old money in a card trick with this money candle card! Birthday Money Balloons – Balloons are always a great way to make a party fun. Money inside balloons? Twice the fun! Cold Hard Cash – These money pun gift ideas are just endless! Definitely a great present from a parent to their kid. Parents are known for their puns after all! Cash Gift Bag – Here’s a simple but effective way to get creative with your money gift – a cash gift bag! Candy Bar Wrapped Money Gift – Candy bars + money, what could go wrong? This is definitely one of the super fun ways to gift money, and it’s delicious too! Money Tree – Wow! This money tree looks amazing! If you’re thinking of creative ways to give money for Christmas, definitely try this one out. Box of Chocolates Money Gift – This box of chocolates money gift is definitely a sweet present for your special one. Christmas Star Money Gift – This festive Christmas star money gift is a frontrunner in the list of creative ways to give money for Christmas. 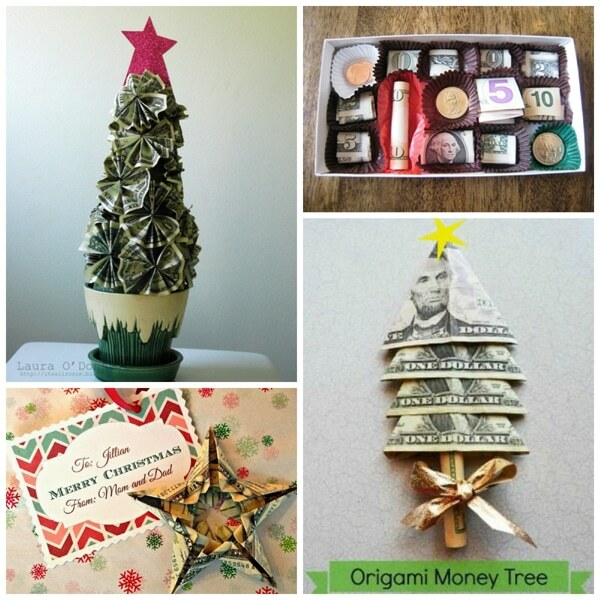 Origami Money Tree – This one is simple enough to make, but it definitely presents a big impact! Money and Gift Card Wreath – A money wreath is definitely one of the creative ways to give money as a gift, but if you add in those thoughtful cards, the value of this present doubles! 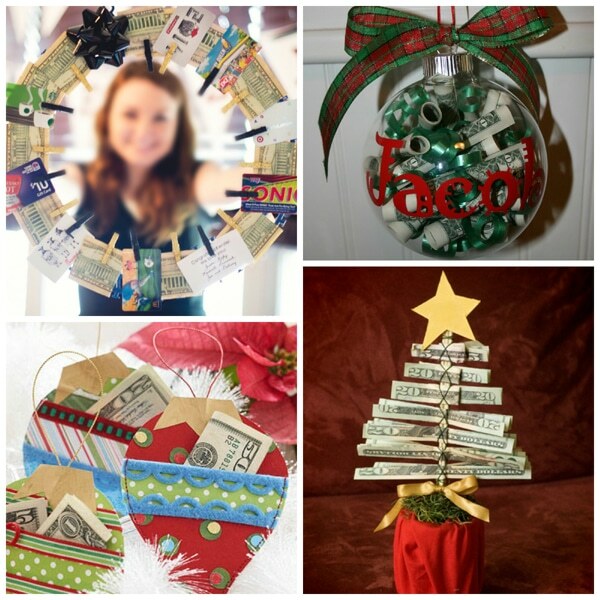 Money-Filled Christmas Ornament – Adorn your tree with these money-filled Christmas ornaments and your family will have more fun taking down the tree after the holidays! Holiday Ornament Money Holder – Another nice ornament idea is this money holder. If you can’t find the clear Christmas balls above, this is a great alternative. Cash Christmas Tree – This cash Christmas tree is a great desk decoration and gift in one! Origami Graduation Cap Money Gift – These tiny origami graduation caps are perfect if you want something with more subtlety to give your new grad! Money Ring– This detailed money ring is another incredibly creative way to give a subtle cash gift for a graduation. 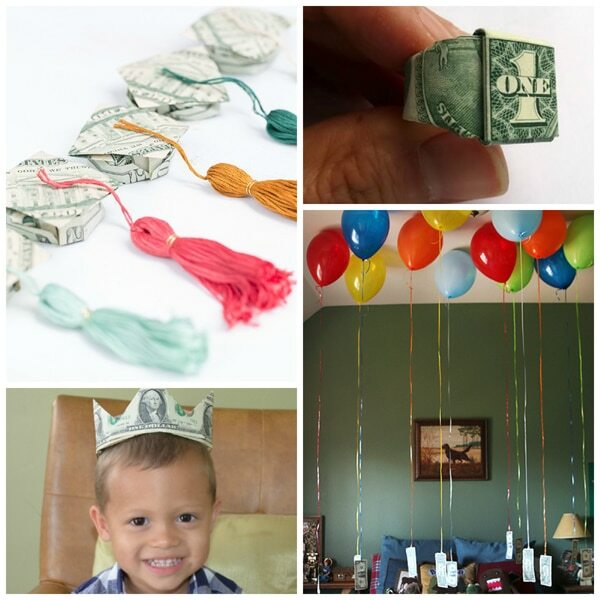 Money Crown – Make your recipient feel like royalty with this amazing money crown. 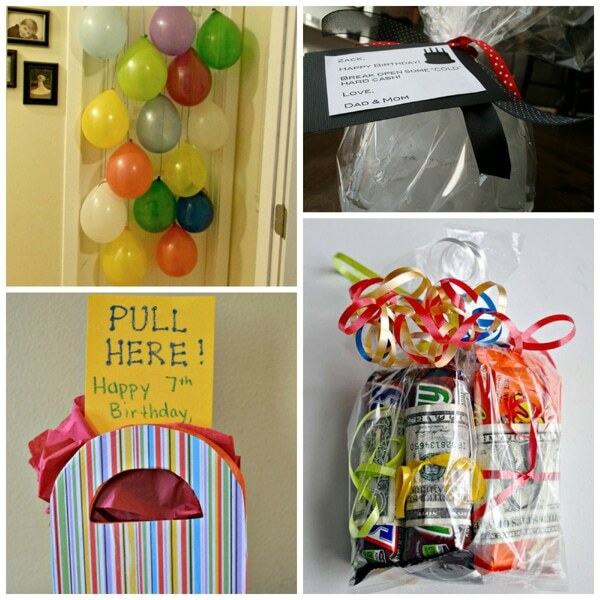 Money Balloons – Awesome ways to gift cash? Give these colorful money balloons a go! Butterfly Candy Lei – This super pretty butterfly candy lei will be the perfect present for a hula birthday party. Money Tree – Here’s another money tree with a little more whimsy in it. It’s a great present for someone who likes dainty things. DIY Money Cake – This money cake with a graduation cap topper is perfect for a post-graduation celebration! Money Bottle Gift – Tired of bringing wine as a housewarming present? How about giving this money bottle gift instead? 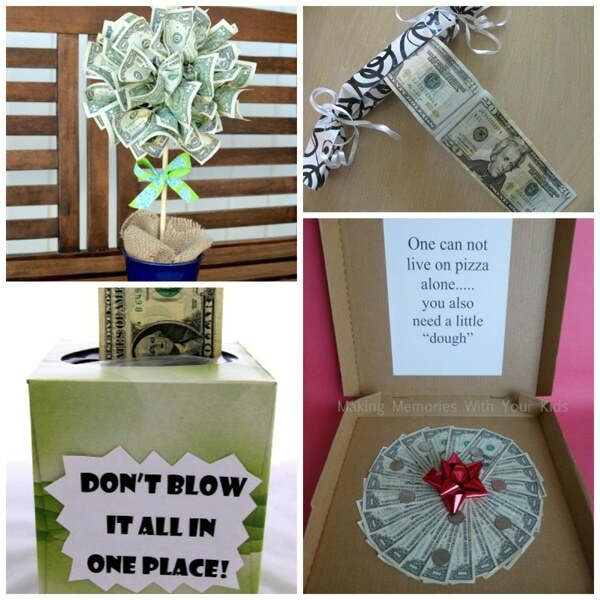 Which of these creative ways to gift cash are you planning to do? What are your favorite ideas from the ones mentioned above? 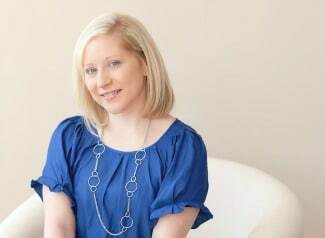 Do you have any other unique money gift ideas to share? Sound off in the comments section below! Thanks for including my graduation money cake! What a great list!